European Union countries have taken a stand against the widely used herbicide glyphosate after researchers connected it to cancer risk in humans. They refused to grant a product license extension. Without this extension, products containing glyphosate could be taken off the market there. Glyphosate is a herbicide used to kill weeds. It was brought to the market by Monsanto in 1974 and has since become a prominent ingredient in products worldwide. It’s prevalence has grown with the rise of crops genetically engineered to be resistant to the herbicide, leaving only weeds exposed to its effects. Though Monsanto’s patent ended in 2000, it is still the world’s leading producer of glyphosate-based products. At last count, the herbicide was present in more than 750 products sold in the United States. Glyphosate originally was touted as a safe alternative to herbicides known to cause damage to crops and harm human health. New evidence, however, suggests that glyphosate is not as safe as believed. It is now classified by the cancer research arm of the World Health Organization, the IARC, as a probable human carcinogen. The IARC reports that there is little direct evidence of cancer in humans exposed to glyphosate, but there is “mechanic evidence.” This includes documented damage to human DNA. There have also been studies linking the herbicide to cancer in animals. Specifically, tumors have arisen in mice and rats exposed to the drug. It was based on this evidence that glyphosate was classified as a probable carcinogen by the IARC. If a direct link had been found with humans, it would have been classified as a definite carcinogenic. Key to the disagreement may be the reference to maximum tolerated doses. While the EFSA takes dosage and real-world scenarios into account when determining the safety of various chemicals, the IARC does not. A number of items to which humans expose themselves daily are classified as probably carcinogenic. High-temperature frying is a good example. Assessing human risk, however, is complicated by real-life scenarios and levels of exposure. Of course, signs of cancer at any level of exposure should be taken seriously when evaluating safety hazards, especially with a product as ubiquitous as glyphosate. The consensus calls for new studies assessing the toxicity potential of glyphosate, given its prevalence and taking real-world daily intake amounts into account. The desire of country members of the European Union to deny a license extension signals that regulators are not willing to wait that long. They want these products off the market now. The EU executive body, in contrast, has been working toward a resolution that allows glyphosate to remain on the market. It proposed a 15-year renewal of the license earlier this year. When that failed, a nine-year renewal was sought. Only when both proposals were shot down was an extension sought. The extension would have allowed the European Chemicals Agency to offer their own assessment of glyphosate’s toxicity before revising another long-term license. Of the 28 EU countries eligible to vote, seven abstained and 20 voted in favor of the extension. Malta voted against. By EU standards, however, the proposal required a “qualified majority,” meaning not just most states but also those states with the most population as well. It was not passed. On June 28 the decision will go to an appeals court. If the extension proposal is not passed, the College of 28 European Commissioners can decide on a proposal independent of member support or allow the license to expire. In contrast to the possible negative side effects of glyphosate, the herbicide comes with a slew of benefits. Among them are increased crop yields, a reduction of energy inefficient plow tillage processes and the adoption of sustainable agronomic practices. Experts also question whether the products used to replace glyphosate will be as safe. If the EU does allow for a license extension without the approval needed, member states could choose to outlaw glyphosate individually. 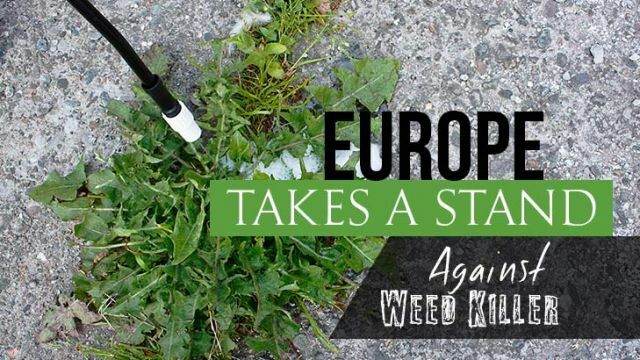 Hey Buddy!, I found this information for you: "Europe Takes a Stand Against Glyphosate Weed-Killer". Here is the website link: https://www.thealternativedaily.com/europe-takes-stand-glyphosate-weed-killer/. Thank you.